What Is Your Purpose For Investing? Will It Help Achieve Your Goals? Your Purpose For Investing – Will It Help Achieve Your Goals? Are you investing for growth or income? The distinction between investing for growth and investing for income should not be seen as a “them or us” battle. Instead, investing for growth or investing for income will depend on the personal circumstances of the individual. The needs of each person naturally differ, and the type of investment you prefer will depend on these needs. 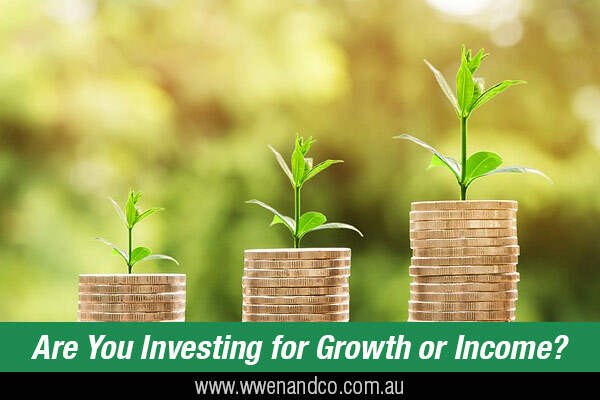 Many investors simply need capital growth and are looking to grow their portfolio for later use with the aim of securing a more comfortable retirement, for example. Other people, already retired, will be looking to receive earnings from their investments, perhaps to replace income from employment. Naturally, as your needs and priorities change, your approach to investing may change as well. You may want to shift a portfolio’s emphasis from growth to income as your longer-term goals are achieved. Investing for growth will tend to require a longer time commitment, as assets such as shares or property will be anticipated to increase in capital value over time rather than provide a quick return. Investors wanting to build wealth over the long term will want to put more money into assets that should increase in value. Having a longer time horizon will also allow some shock-proofing for the inevitable ups and downs of markets. Investing for income will have more appeal if you are counting on some cash to meet living expenses or meet a short-term goal. While the aim should include keeping the principal base stable, the idea is to have a predictable income stream from interest payments or dividends that are earned on the value of that principal amount. Of course, there is also the idea that a healthy investment portfolio will have a balance of both growth and income assets, with part of the portfolio geared for growth while another part is tailored towards income producing investments. Many investment assets will have elements of both growth and income, and the share market abounds with examples of stocks that will offer both capital growth and dividend generation. The likely difference between different shares will be the emphasis given to delivering returns – of either the growth or the income variety. One company, for example, might review profit more regularly and distribute it via dividend payments. Making a return on investment will therefore not rest entirely on selling the shares, and if the company pays regular dividends, the investor can continue earning over a prolonged period. The downside of this tactic, however, is that dividends can always diminish or even dry up. A company that emphasises growth will more likely reinvest profits back into the company, and so not allocate the same amount of earnings for dividend payments to shareholders. However, that reinvestment that should see increased company value (and share price), which will translate into cash for the investor when the stock is eventually offloaded. The risk, of course, is always that the share price could fall below the price that an investor paid for it, resulting in a capital loss rather than a capital gain. The tax consequences of each differ too, with interest earnings counted towards assessable income (although share dividends can be treated differently due to the imputation system, which sees tax paid in the hands of the issuing company). Earnings from growth (capital gains) will come under the CGT rules.